Salzburg is small cosmopolitan and a very picturesque city with fascinating architecture, and rich cultural heritage. As the birthplace of Mozart, Salzburg prides itself on being a destination for music. Every year the Salzburg Festival draws Mozart fans and music lovers in droves. 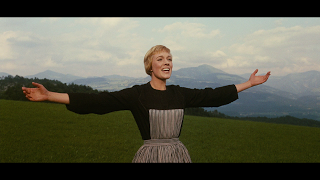 ‘The Sound of Music” also put Salzburg on the map. At first, I was skeptical about taking the Sound of Music Tour because I thought it was cheesy. This tour turned out to be an excellent way for exploring the region. The first part of our tour was a drive to Untersberg where the first scenes of the film took place. The palaces and charming little village homes set against the looming Austrian Alps provided a very picturesque setting throughout this whole drive. The hills were alive indeed! Our coach drove past Leopoldskron Palace (which was the first view we have of the Von Trapp family in the film). We did not stop at Leopoldskron Palace as it’s now a private residence, not open to the public. We just saw the façade. ﻿﻿﻿Then our coach drove to the direction of Anif for us to see the second house of the Von Trapps – Hellbrunn Palace. We stopped at Hellbrunn Alley first. Then we walked to the Hellbrunn Palace ground where we found the iconic gazebo or glass pavilion. According to our tour guide, the gazebo, which was moved from Leopoldskron Palace to Hellbrunn Palace, was reconstructed for tourists. We were treated to the breathtaking views of the countryside, the lakes and the Austrian Alps on our way to the church at Mondsee where the movie wedding of Maria and the Baron was filmed. ﻿﻿﻿We continued the Sound of Music Tour on foot and hiked uphill to the Fortress and the Nonnberg Abbey where the real Maria was a novice. The Nonnberg Abbey was supposed to be the oldest convent in Austria, if not in the German-speaking part of Europe. The scene when Maria coming late to mass was filmed there. The views from the abbey were spectacular that I stopped paying attention to the Sound of Music narrative. I thought it was the best place to look over the roof of Salzburg where I was be able to see the church domes and spires with some architectural details. While the fortress was visible from all over the city, the view from the top was breathtaking – the Austrian Alps, the hills, the surrounding green landscape which rolled and dipped in lush waves, and the city with the church domes and spires. Salzburg loomed like a fairytale illustration from the hill vantage point. From the Nonnberg Abbey, we walked downhill past the Augustiner Bräu Monastery. It was funny how some of our tour mates left the tour for the brewery. The old town was so compact and manageable that you would not be afraid to venture on your own or leave your tour group. Needless to say, the tour participants dwindled by the time we got to the next few highlights – St. Peter cemetery, the gardens and the Festival Hall (used in the film as the entrance to the auditorium). So our tour guide gave us extra narrative about the movie and the story of the real music coach while waiting for those who veered off the tour path. The tour concluded at the Old Town Mozart Square, a few steps away from the most famous landmark - #9 Getreidegasse (Mozart's birthplace). ﻿﻿Getreidegasse Street (with many shops and coffee houses), the Cathedral and many buildings that surrounded it, the museum, the festival theater, the Hohensalzburg fortress, Nonnberg Abbey, the Mirabel Palace across the river, and other monuments were within a mile or less around Mozart Square. After the exhilarating hike, I thought I would reward myself with apple strudel and coffee, but decided against it and had some 'serious' lunch instead. Our local tour-guide recommended the 'Getreidegasse Restaurant' for its atmosphere and price, but we explored and found a tiny restaurant inside a very quaint plaza (more like the pathway from Getreidegasse St to the open market plaza). I ordered Wienerschnitzel and salad. I thought it was rather interesting to see the waiter slipped through the open market and came back with a bag of greens. Yes, my salad was that fresh. Salzburg or the whole country of Austria was environmentally friendly. I noticed this from small things such as the absence of choice for printing ATM receipts. Of course I could not leave Salzburg without sampling the apple strudel and coffee at the Café Tomaselli, the oldest coffee house in Austria (founded in 1703). It was said that Wolfgang Amadeus Mozart and other famous artists frequented this coffee shop. I felt transported to a different time and place as I sipped my coffee and ate my apple strudel. As I stepped out of the Café to the Old Town Mozart Square, it was hard not to notice the turreted fortress up above set against the looming Alps. Salzburg is a World Heritage site and deservedly so. Last night I dusted the DVD off and watched the movie for the umpteenth time. Having visited Salzburg where the movie was filmed, and walked the same ground that Julie Andrews had trod many years ago, a real connection was born again with me as I watched the opening scene: from the clouds to an aerial view of the rocky, snow-covered mountains, and into a green wooded valley with steep cliffs that descend into a lake, and Julie Andrews twirls and sings, "The Hills Are Alive with the Sound of Music..."